In 1987, at a meeting in Swanwick, the churches present adopted a declaration on Christian unity. 'Churches Together' was the result of this process which replaced the British Council of Churches with bodies that included a broader spread of churches, especially the Roman Catholic Church. Churches Together places the emphasis upon the Churches in pilgrimage together towards full visible unity rather than ecumenical institutions acting and speaking on behalf of the church. 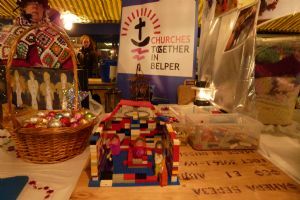 CHURCHES TOGETHER IN BELPER (CTIB) meet regularly to pray and to plan activities and strategies which demonstrate their united vision for mission in the town. They worked alongside a community drama group to perform The Belper Passion on Good Friday 2013, 2014 and 2018 and The Resurrection in 2015. 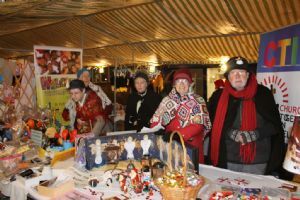 They have had stalls at the 'Christmas Lights Switch-on' evening and, with the enthusiastic co-operation of local shop managers, had two Christmas competitions during Advent. The week of Prayer for Christian Unity started on 18th January 2019. There will be an opportunity to come together and pray for the churches and activities across the town TODAY, Sunday 20th January, 6pm at St Mark’s Church Openwoodgate. Music will be supported by the local youth worship band and our young people will be taking part. there will be excellent refreshments! Ecumenical Open Eucharist for UNITY at Christ Church Belper, Thursday 24th January 2019, 6.30 pm. On Thursday 31 January 2019, at 7pm in the Baptist Church we have our AGM and first meeting of 2019. The main aim of our meeting is to discuss and try to decide how we mark Easter this year in our town. The meeting is OPEN to anyone from our churches: we need lots of ideas and helpers...... PLEASE COME AND JOIN US- it is good when we work together. Thank you ! !